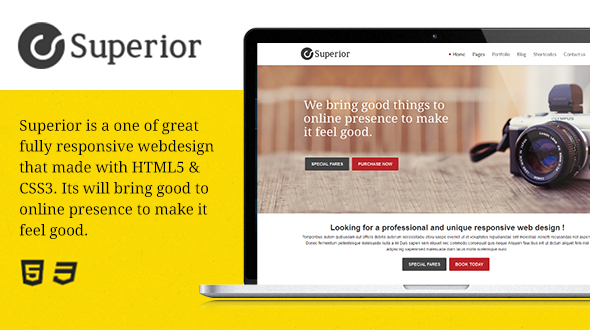 Superior theme is a one of great fully responsive and clean, super flexible creative wordpress themes (try resizing your browser), that made with HTML5 & CSS3. Its will bring good to online presence to make it feel good. This theme is easy to use and easy to customize with this creating page layout is really easy you just need to drag and drop blocks and your new page with new layout will be ready in minutes. Superior theme is a multipurpose theme which can use any type of website blog, news, Photography, art, Image Gallery, Business, Blog, Fitness, Education, personal site, product site etc. Due to its simple design its keep every look easily. Superior theme this a good chose for good website because its bring good to online presence to make it feel good. Superior Theme is a good chose for photographers. Mange and create photo albums and gallery in different layout is easy with Superior Theme. Its have 12 beautiful different galley layouts that’s great for show different gallery in different and elegant look and every gallery single image have beautiful page there people can comments. You can easily add images in to gallery just by drag and drop.